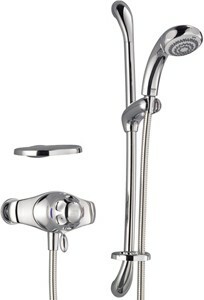 Mira Excel > Exposed Thermostatic Shower Kit with Slide Rail in Chrome. Exposed Thermostatic Shower Kit with Slide Rail in Chrome. Mira Logic easy-clean shower fittings, with four spray patterns: Start, Soothe, Force and Eco. Maximum temperature stop for your protection. Automatic shutdown if water supply fails for complete safety. Large filters ensure shower works effectively even if 50% blocked. Easy installation features save time and installation costs. The Mira Excel range of bathroom showers and taps gives a coordinated, sleek and tactile finish to your bathroom or cloakroom. 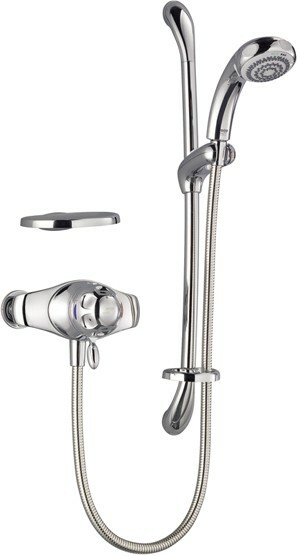 The UK's best-selling thermostatic mixer shower, the Mira Excel shower is unbeatable at all pressures. It's Mira's most advanced and versatile mixer shower, featuring precise thermostatic control, which recognises and compensates for changes in water temperature to give you an extremely safe and satisfying shower. Recently improved to make installation even easier it's no wonder Mira Excel continues to be the professionals choice. 5 Year guarantee: Mira guarantee their Excel bathroom showers and taps for 5 years.